So basically, just an update to say that we've changed what we're using to keep track of votes and as such there are some new things in place that should spice things up a little. We could really use your help to get to the top of the list where we belong! 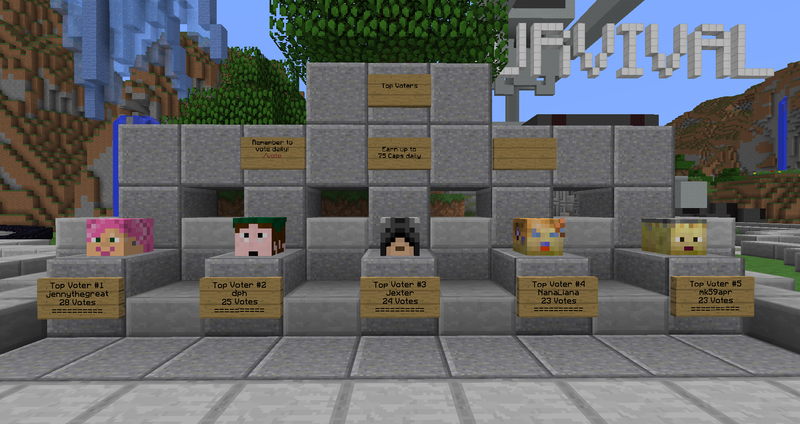 We plan to bring top voter rewards in the future. All you have to do is vote for the server daily. To do so, follow the links below and make sure you enter your in game name for your reward. Again we've been working pretty hard to get this out to you ASAP. The world follows a similar claiming system to Build, however thanks to NineteenGiraffes we have an in game claiming plugin that makes claiming easier for both you and us. The largest claim size will require you to submit plans on the forum. The feather item will show you claim information as you walk/fly over. We hope you're enjoying your Easter Holiday. We've been working furiously on the Arena setup and it is now open for all to fight to the death. Arenas will be cycled (no solid time on cycle just yet) with an upcoming contest for Arena creation (details to come later).